Out of all the classes I signed up for this semester I was probably the least excited about Baptist History. I mean...just listen to the name...Baptist History. It just screams boring. History's never really been my bag. Who cares about a bunch of old dead white guys? I was wrong. I absolutely love this class. I find it extremely fascinating. I think I've narrowed it down to two main reasons why I enjoy it so much. First of all, I did not grow up a Baptist. I grew up in the Roman Catholic Church. I'm no expert on the RCC, but I know a lot more about it than I do about Southern Baptists. I've been learning a lot about how the Baptists came to be and their ecclesiology (fancy seminary word, here's the wiki explanation). I love it. I feel like I can articulate better why I have chosen the Baptist denomination to fellowship with. Second, my professor is the man. Honestly, Southeastern is full of great professors. I've enjoyed them all (for the most part) and feel so blessed to learn from these guys. That being said, Dr. Finn says stuff like, "He was their Sugar Daddy," and references songs like, "Don't Stop Believin'." 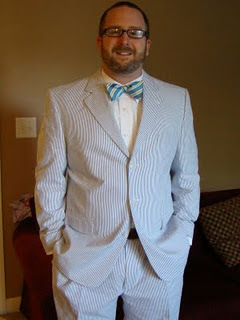 Plus, he wore an authentic Southern seersucker suit on the first day of class. First time I had ever seen one of those in real life. His proud wife posted this picture on her blog. I'm looking forward to the rest of this semester. Not just for this class...I'm genuinely loving all my classes (Counseling Parents & Children, Old Testament 1, and Counseling Practicum 1). Happy Fall Semester to all.